Coagulation and heamostasis is a very important process in healing for any minor or major injury. Hemostasis or haemostasis is a process which literally means stopping of bleeding due to vasoconstruction. There are three stages in which Hemostasis takes place – Vascular spasm or Vasoconstriction (blood vessels constrict for a short duration), Platelets form a plug (Platelet Plug) and the last stage being blood clotting or coagulation which reinforces the platelet plug with a fibrin mesh. This platelet plug seals the injury or hole until the injured tissue is repaired preventing loss of blood. 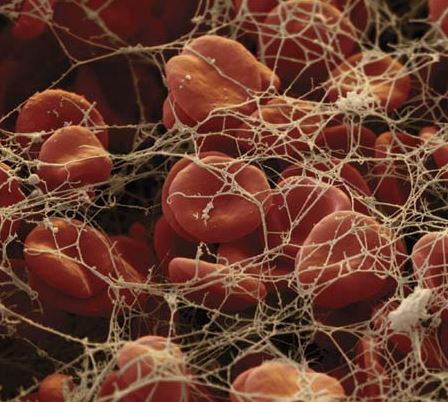 Now let us look at what is Coagulation – It is the process of liquid (Blood) to turn into a Gel or a semi-solid state. This involved the process where colloidal particles come together to form a large sized particle to block the loss of blood. The process of Hemostasis or Coagulation involves participation of many coagulating factors and Vitamins. Role of vitamin K, Liver and vascular wall in Hemostasis and Coagulation. Helps in synthesis of procoagulants, factors VII, IX, X, prothrombin, circulatory anti coagulant, protein c.
Vitamin k deficiency causes hemorrhagic disorders. Synthesizes some procoagulants like factors V, VII, IX, X, prothrombin, fibrinogen, as well as anti coagulants, heparin, antithrombin III and protein C. Liver failure thus can cause signs and symptoms of hypocoagulability as well as hypocoagulability. Sub endothelial layer is highly thrombogenic. Contact with blood triggers off coagulation. Endothelial layer is primarily opposing clotting as it is a barrier between blood and sub endothelial layer. But also releases some procoagulants. Vasospasm is an aid to hemostasis. Hemostasis and Coagulation are very important for human body in case of an injury or trauma to prevent further blood loss and Liver, Vascular Walls and Vitamin K play a very important role in the whole process of Hemostasis. Any deficiency or abnormality in any of the three can lead to improper coagulation or Hemostasis.